Mads Anneberg's profile on Ricardo Morris and Repúblika. THREE STUDENTS from AUT University covered Fiji's historic “from dictatorship to democracy” general election this month. While the election arguably legitimised Voreqe Bainimarama’s so-called 2006 “coup to end all coups”, the students performed something of a coup themselves. Not only were they providing the first ever comprehensive coverage of a Pacific national election by a New Zealand journalism school, but their reportage was far superior to much of the Kiwi media that was ill-prepared for the occasion. In fact, some were unashamedly parachute journos covering a complex event on September 17 that was overshadowed by New Zealand’s own election three days later. All three students were reporting as a “package” for Pacific Scoop, the course outlet for AUT’s postgraduate Asia-Pacific Journalism course run by the Pacific Media Centre. But while two were on the ground in Fiji, the third was an “anchor” - monitoring, writing and editing stories to provide an overall contextualised story. A Fiji democratic mandate for the coup leader – what now for the media? IN THE END, it was no real surprise. For 2006 coup leader Josaia Voreqe Bainimarama, who retired recently as the military strongman with the rank of rear admiral, it was a foregone conclusion that he would emerge as the triumphant victor in Fiji’s first general election in almost eight years. Just as it was inevitable in 1992, when the original coupster - who staged two coups in the same year, 1987 - Brigadier-General Sitiveni Rabuka made the transition from military backed prime minister to civilian leader. A major difference is that Rabuka was elected in 1992 on an indigenous supremacy platform of “Fiji for Fijians” while Bainimarama’s Fiji First party is pledged to a multiracial “Fiji for all Fijians”. The hope is that Bainimarama’s authoritarian streak will gradually mellow and he will come to recognise as an elected leader the critical importance of a civil society discourse with a strong non-government organisation sector and an independent Fourth Estate. The media was once a proud and feisty part of Fiji democracy. It can achieve that credible status again. UNFORTUNATELY, it had to happen but all is not lost. It started with Fiji Labour Party leader and former Prime Minister Mahendra Chaudhry – deposed in the 2000 attempted coup – complaining about a minivan showing a Fiji First sticker during the blackout period and another alleged election breach when a disabled voter at St Joseph’s in Suva was assisted by an election officer with no witness present. Then there were complaints that the counting had stopped when all that had stopped were the announcements, and Radio New Zealand International quoted an unnamed SODELPA official saying its agents had noted anomalies in the transmission and counting of votes, and Fiji Leaks claimed the Multinational Observer Group (MOG) were having “a good holiday in Fiji”. He said he’d “forewarned political parties of this some time ago.” Not a shred of evidence — but he made sure his prophecy came true. Livestreaming with Repúblika editor Ricardo Morris and Pacific Scoop’s Mads Anneberg. WHILE the results are provisional at this stage, it is quite clear today that the people of Fiji have given coup leader Prime Minister Josaia Voreqe Bainimarama a democratic mandate. His Fiji First party was polling way ahead of the opposition Social Democratic Liberal Party (SODELPA) at 6am this morning when counting was suspended until later today. With 1244 of the 2025 polling stations tallied by the Fijian Elections Centre, Fiji First with a multicultural policy of “Fiji for all” had 233,094 votes, or 60.2 percent of the total vote – more than double the indigenous party SODELPA, which represents the political group ousted in the 2006 military coup. PRIME MINISTER Voreqe Bainimarama took an early lead in provisional results in the Fiji general election tonight. 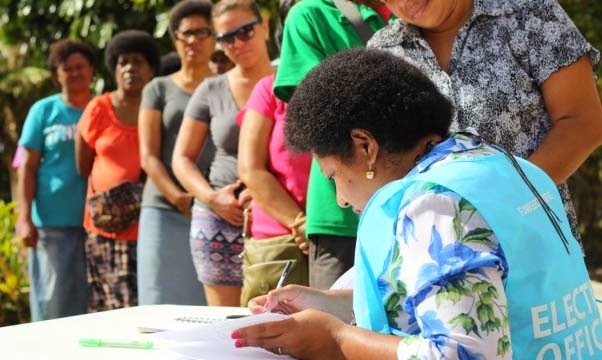 With provisional results from 43 out of 2025 polling stations processed, the Fiji First leader topped the five best-placed candidates with 2339 votes, well ahead of rival SODELPA’s Ro Teimumu Kepa with 628. 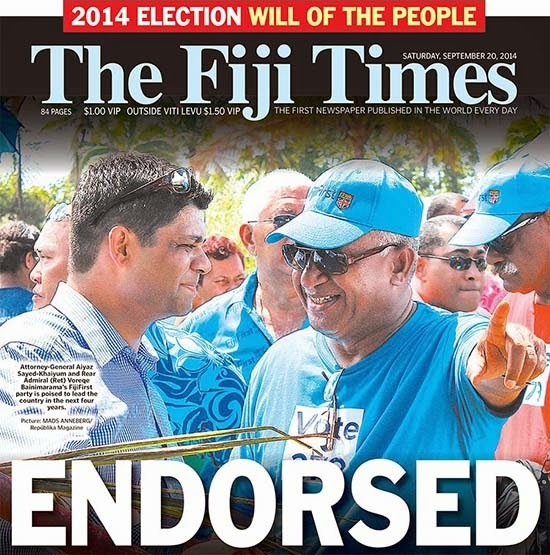 But in the party stakes, Fiji First held a narrow lead with 48.3 percent while SODELPA had 42.1 percent. This is the first election in Fiji since Bainimarama staged a military coup in 2006. 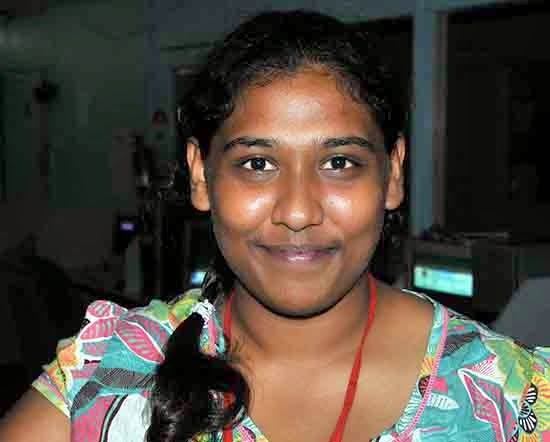 Alistar Kata is a member of the student journalism team covering the Fiji elections as part of their Asia-Pacific Journalism course at the Pacific Media Centre. She is on internship with Wansolwara while her colleagues are Mads Anneberg with the Republika in Suva and Thomas Carnegie and Pacific Media Watch editor Anna Majavu with the PMC in Auckland. Pulitzer prize-winning journalist Glenn Greenwald (left) and Kim Dotcom at the "moment of truth"
NEW ZEALAND Prime Minister John Key has been accused of allowing the secret installation of equipment that would enable spooks to tap into New Zealand's undersea fibre optic cable as part of a covert mass surveillance system of citizens. This was the word from globally acclaimed whistleblower Edward Snowden and Wikileaks founder Julian Assange (both speaking via video link), Kim Dotcom and US Pulitzer prize-winner Glenn Greenwald last night at a packed meeting of more than 2000 people in Auckland. The hall was so full that another 800 people could not get into the venue at the Auckland Town Hall. In a major political coup for the Internet-Mana alliance which organised the seminar and which is contesting the New Zealand national elections this Saturday, the three speakers painted a grim picture of individual privacy and internet freedom under New Zealand's ruling National Party. Dotcom told the meeting that there were only two ways to fight mass surveillance - through political mobilising, as the Internet Party was doing and through encryption. BLACKOUT DAY – day one of the “silence window” in Fiji leading up to the close of polling in the general election at 6pm on Wednesday. And this is under the draconian threat of a $10,000 fine or five years in jail for breaches. These are the penalties cited in a media briefing distributed to journalists covering the elections last week. But a closer reading of Part 4 “Electoral campaigns and the media” in the Elections Decree 2014 reveals that there are even harsher penalties of up to $50,000 and 10 years in jail for offenders. And this could include social media offenders. The International Federation of Journalists was quick to pick up on these heavy penalties and fired off a protest. “This is a gross violation on the freedom of the media ahead of one of the most pivotal elections in Fiji history,” says IFJ acting Asia-Pacific director Jane Worthington. In an interview with Radio New Zealand Mediawatch presenter Colin Peacock, who has a keen interested in digital media developments, the Pacific Media Centre’s Thomas Carnegie was told the penalties were “unduly harsh” and would restrict political debate just when it was needed the most. THE PARIS-based media freedom advocacy organisation Reporters Sans Frontières and the Pacific Media Centre have condemned threats and intimidation against political reporters covering Fiji’s first parliamentary election campaign since the 2006 coup. Two women journalists – Vosita Kotowasawasa of the Fiji Broadcasting Corporation (FBC) and Jyoti Pratibha of the Fiji Sun newspaper – received death threats on Tuesday over their previous day’s coverage of the cancellation of a live TV debate between the leading contenders for the post of prime minister. According to Pacific Scoop, a news website affiliated with the Pacific Media Centre, Kotowasawasa received several threatening phone calls while Pratibha was threatened via fake Facebook user profiles. Both had covered the previous day’s last-minute decision by Ro Teimumu Vuikaba Kepa, the Roko Tui Dreketi and head of the Social Democratic Liberal Party (SODELPA), to pull out of the debate with interim Prime Minister Josaia Voreqe “Frank” Bainimarama. RECENT claims by Indonesian authorities that there was a fresh “open door” policy over inquisitive journalists wanting to enter West Papua and report “on the level” have turned out to be false. Hopeful signs through insightful reports (long with intelligence minders) by SBS Dateline’s Mark Davis, Michael Bachelard of The Age and The Sydney Morning Herald’s Jakarta bureau and AAP’s Karlis Salna that the Indonesian government had indeed seen the light – or at least was having a serious rethink – have turned out to be nothing but a mirage. However, the detention of two French journalists – who are facing charges of “treason” and “immigration crime” – and a West Papuan tribal leader early last month has made a mockery of the new Indonesian policy.